In case you have not yet heard, or you did hear but were understandably somewhat confused by all the legalese, yesterday, October 23, the 16th Circuit Court of Jackson County (Kansas City) ruled against Planned Parenthood. The ruling was in response to Planned Parenthood’s state-wide challenge last Wednesday, October 18, to the enactment of a specific part of SB 5, the sweeping pro-life legislation that was approved during the special session called this summer by Governor Greitens and went into effect this morning, October 24. In particular, the challenge was to the specific language in the new law regarding “informed consent” and who must provide the limited but specific information to a woman considering an abortion prior to the procedure. The court simply ruled that if abortion is healthcare, it simply needs to be treated like every other out-patient medical procedure where the person performing the abortion must be the one to explain the procedure, to discuss the risks of the procedure and to answer questions for the patient. Although this completely sensible requirement does further illustrate the inherent problems with abortion, the facts that Missouri had a 72-hour waiting period between the time of this consultation and the actual procedure and the fact that very few doctors in Missouri want anything to do with abortion are both beside the point. Basically, Planned Parenthood promotes abortion as healthcare when it wants $500 million in federal tax subsidies but denies it is healthcare at all when it is expected to comply with the most basic requirements we all demand and the most basic courtesies we all expect when it comes to something as routine as having a tooth pulled. In this case, Planned Parenthood failed in their attempt to argue both at the same time. Here is the response by Planned Parenthood and the ACLU regarding the court decision yesterday. Stay tuned! ​As you know, I am not necessarily a proponent of trying to keep a tally of “babies saved” for two reasons. First, we are simply tools in the hands of the master and it is not for the tool to determine how it is used. Secondly, and more importantly, with thousands of cars driving by each day there is no way of actually knowing the full impact of simply standing on the sidewalk in silent prayer. Prayer is the single most powerful tool we have, it is something in which everyone can participate and it is not affected by laws or the weather or the responses of abortion providers. The Respect Life Office is currently developing a prayer ministry that can be supported on the sidewalks, in our parishes or anywhere people interested in stopping the scourge of abortion are within our diocese. 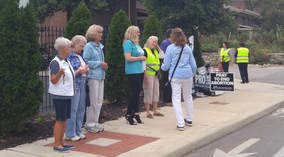 We are also working with the Archdiocese of KCK to provide additional sidewalk counseling training and an on-going presence at the various abortion-related facilities in our area. If you or someone you know is interested in participating in this effort, please contact the Respect Life Office. The Midtown KC Planned Parenthood will be closed on Columbus Day, Monday, October 9. Therefore, no Monday morning consultations means no Thursday afternoon abortions next week! The next consultations for abortions will occur on Monday morning, October 16, nine days before sweeping pro-life legislation goes into effect within our state. We are truly blessed to have each Spring and Fall in our area, a 40 Days for Life Campaign peaceful prayer vigil. Lives, known and unknown, are saved during this time. However, we must realize this is not the sole purpose for our participation. The Blessed Mother and the disciple, John, stood at the foot of the cross with Our Lord who was without sin in His hour of the death. Likewise, our own steadfast union with our most innocent and most defenseless brothers and sisters during their hour of crucifixion may be the only act of love some of these children of God experience during their short lives here on earth. If not for the unborn child, we must do it for the soul of the mother. We are called by God to be our “brother’s keeper” and God deeply desires and loves each of us. The mother, often hurting and afraid, needs us to love her back to God in that moment. If not for the vulnerable mother, we must do it for Christ. “And the king will say to them in reply, ‘Amen, I say to you, whatever you did for one of these least brothers of mine, you did for me’ (Mt 25:40).” Mary and John did not abandon Christ, simply because they could not save Him. These are God’s children, children He died for. Sharing in their suffering is an opportunity to share in the suffering of Christ. If it is His will, we will all have the opportunity one day to share in the love of Christ with these innocent children. Let us pray they will be our voice when we too are silenced by death in our hour of judgment. On behalf of the Respect Life Office, I encourage everyone who is committed to defending the lives of our unborn brothers and sisters, and to protecting the lives of their vulnerable mothers, to prayerfully consider accepting the invitation to be a witness during October, Respect Life Month. We will gather every Monday morning and Thursday afternoon at 1001 Emanuel Cleaver II Blvd, Kansas City, MO 64110. You may contact the Respect Life office for more information. To participate in the current 40 Days for Life Campaign in Overland Park, KS, please contact either 40daysforlifekc@gmail.com or visit www.40daysforlife.com/local-campaigns/overland-park for more information. Thank you for your prayers this week! As long as even one defenseless unborn child is violently robbed of his or her God-given gift of life, we can never truly rejoice. However, as our Blessed Mother set aside her own fears at her time of uncertainty during an unplanned pregnancy, hope and joy have firmly taken root where the seeds of evil were thought to have been sown this week because at least eight brave mothers and a team of brave prayer warriors and sidewalk counselors came together, set aside their collective fears and said, “Thy will be done”. We have now received the inestimable blessing, unworthy though we are, of once again sharing in His unfailing grace and mercy by being that same witness this coming Monday morning and Thursday afternoon. Given the apparent scramble of PP employees late yesterday, it is possible that after the unanticipated outcomes of this week, activities and hours may be shifted next week. However, with a mandated 24-hour pre-consultation, a mandated 72-hour waiting period and the need to separate abortions from all other activities due to Title X funding requirements, there are not many alternatives unless PP chooses to work weekends or to extend the time frames between appointments beyond what is legally required. Therefore, if you are available, please prayerfully consider spending an hour or two in silent prayer on the sidewalk at 1001 Emanuel Cleaver II Blvd. in Midtown KC starting at 8:30 a.m. Monday. ​Thank you to everyone who came out to pray on the sidewalk at the Midtown KC PP Monday and to everyone throughout the diocese who “showered” us with prayers. [Attached] is a wonderful summary from our partners in Columbia who left home at 4:30 a.m. Monday to join us. Please prayerfully consider organizing a small group to spend an hour or two in silent prayer during the next month at the Midtown KC location. You can contact the Respect Life Office or Wendy Curtis with KC Coalition for Life at 40daysforlifekc@gmail.com for details and to schedule someone to be present with your group on the sidewalk. The Respect Life Office is working with KC Coalition for Life and other local pro-life leaders to sponsor the upcoming 40 Days for Life Campaign, September 27 – November 5. Please prayerfully consider whether the Holy Spirit is calling you and your parish ministry or organization to be a witness in this very special way. By now, you have likely also heard about one or both of the cases below in our area. This is a quick update as we assess the possibility of expanding the 40 Days for Life Campaign sidewalk presence. Of course, we understand that each is a manifestation of the same evil but the situation with Planned Parenthood is receiving most of the attention. ​As disappointing as it is, the most recent developments are not a surprise to most people who have been following the issue in Missouri over the summer. The Respect Life Office has been working directly with Missouri Catholic Conference and with pro-life and sidewalk counseling organizations throughout the state and in the Archdiocese of KCK to make sure everyone is prepared and has the most current and most accurate information. We are also working with representatives from state and local legislators’ offices where appropriate and we have recently had the opportunity to work with local media to make sure the Church’s position is being presented accurately as everything unfolds. With the sweeping pro-life laws that will be taking effect in our state at the end of October, thanks to you, it is no surprise PP is now racing to open as many locations as possible in Missouri as quickly as possible in order to demonstrate maximum hardship once the laws take effect. As would also be expected, there is a great deal of legislative posturing going on behind the scenes but please understand that ending abortion in Missouri remains a top priority of not only our Governor, but also our Secretary of State, so this is definitely not the final word. In court, one of the biggest legal challenges will probably result from reconciling Missouri’s 24-hour physician consultation period with the 72-hour waiting period since most abortionists come in from out of town and are used to seeing patients for only15 minutes or so on the day of the procedure. This is not an issue for any other scheduled medical procedure, but then again, abortion is not healthcare. To understand that the new laws are absolutely reasonable and are intended to protect the lives of both mother and child, one need look no further than St. Louis where there have been no fewer than 67 ambulance visits to Planned Parenthood since 2009 and the fact that no hospital in our own area is currently willing to grant admitting privileges to “transient” abortionists. Please keep everyone involved in this fight in your prayers as you discern whether you are being called to sign up for one or more time slots during the Fall 40 Days for Life Campaign.